Margarita house has 17 en suite rooms each equipped with a TV, a private terrace, private bath and WiFi.Margarita House also provides excellent, quaint conference facilities that can accommodate up to 15 participants. Their well manicured gardens can be used for private functions such as wedding photo shoots, corporate events and private parties.Margarita House boasts of an extensive and sumptuous continental cuisine menu.Margarita guest house is one of Kenya's best kept secrets. It is a top guest house fittingly located on the periphery of Nairobi city, Kenya in the up-scale suburb of Karen. 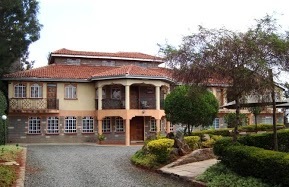 The guest house is conveniently located within 10 minutes drive of major local tourist attractions such as the Nairobi National Park, Karen Blixen Museum, Nairobi Mamba Village, The Giraffe Center and Langata Botanical gardens. If you are looking peace and quiet Margarita House is the destination for you. Our Ideal location in the Karen area provides the perfect setting for a relaxing, comfortable and tranquil experience during your stay. Airport transfer from Nairobi Jomo Kenyatta International airport or Wilson airport to Margarita Guest House or trasfer from Margarita Guest House to Nairobi Jomo Kenyatta International airport or Wilson airport.